Turkey breast, water, honey, contains less than 2% of modified cornstarch, sodium lactate, salt, sugar, carrageenan, sodium phosphates, sodium diacetate, sodium ascorbate, potassium chloride and sodium nitirate. Turkey breast meat, water, salt, potato starch, turbinado sugar, carrageenan, baking soda, cultured celery powder and cherry powder. 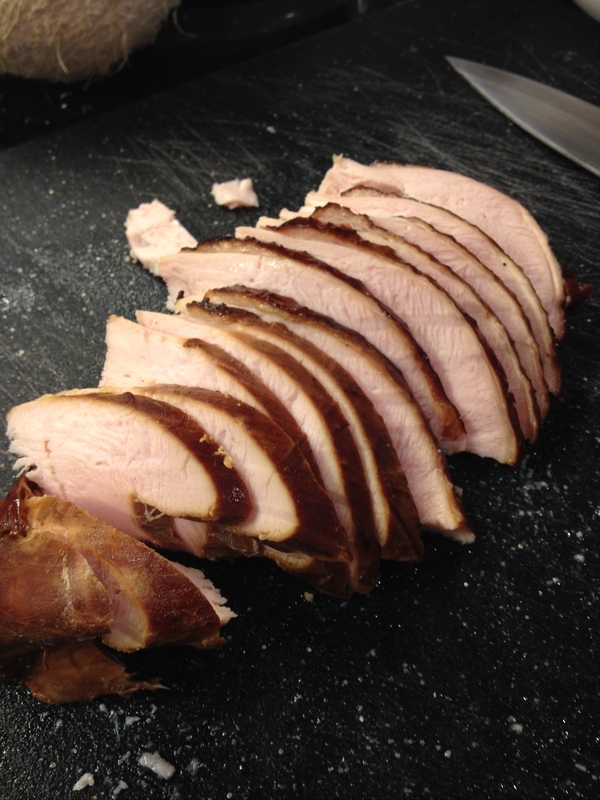 So, I decided to smoke my own turkey to slice for lunch meat. I purchased a whole turkey breast, bone-in for less than $2 per pound. This one breast has enough meat to keep a family of four in lunch meat for a week. Keep in mind that, as the meat cooks, it will lose some of its weight. It will probably also lose half of that weight when it comes off the grill because no one will be able to resist it! In a large pot, bring all brine ingredients to a boil. Turn off heat and let mixture cool. Meanwhile, wash turkey breast and place in a large, non-metal bowl. 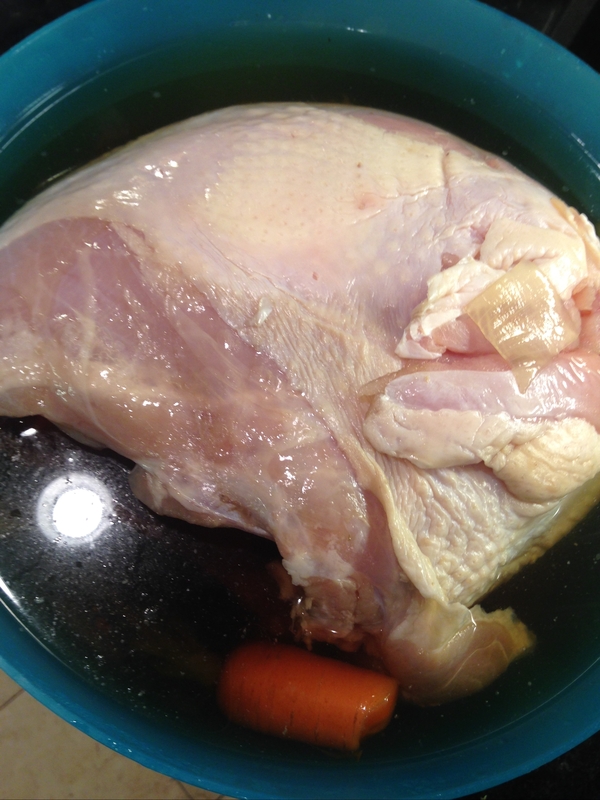 Pour cooled brine over turkey and cover. Place turkey in the refrigerator for 2-3 days. Remove bowl from refrigerator and bring to room temperature. Place several coals in the bottom of your kettle BBQ (I use a Weber). Light coals, let burn for 15 minutes, then move coals to the outer edges of your BBQ to form a ring. Place soaked wood chips on hot coals, add cooking grate and position turkey breast in the middle. Replace BBQ lid and turn vent to low. Cook for around 2-2 ½ hours, turning every 45 minutes. Once temperature reaches above 165 degrees, remove from BBQ, cover with aluminum foil and rest at least 15 minutes if serving hot. If you are cutting lunch meat for the week, once meat is cool, carefully remove breast from bone and slice meat against the grain. If you want a thinner, more Oscar Mayer look to your turkey, wrap breast tightly in plastic wrap, chill overnight and slice thinly on a meat slicer or with a very sharp knife. Store in an airtight container in the refrigerator. While this brine is perfect for me (for today), don’t be afraid to play around with your own brine. Maybe you like things sweeter or hotter. Perhaps Indian spices are more your speed. Go for it! You can’t do worse than potassium chloride. Tags: brine recipe for turkey breast, food, homemade lunch meat, homemade smoked turkey breast, how to brine turkey, how to get cheaper lunch meat, lunch meat from scratch, lunchmeat, recipes, Turkey breast lunch meat, using woodchips on Weber, what is in processed lunch meat, with images. Bookmark the permalink.